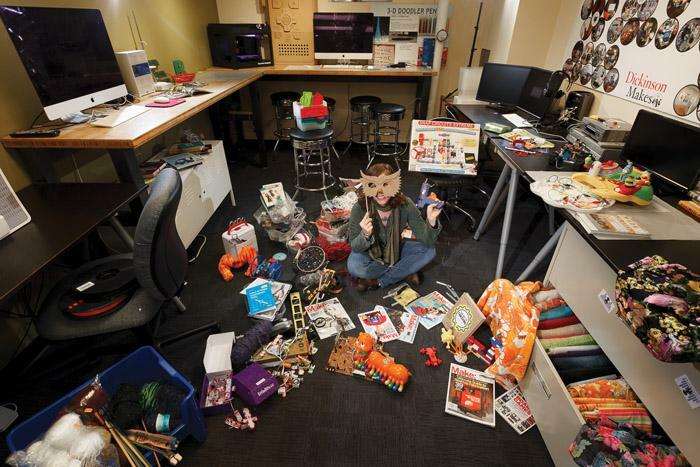 Multimedia Specialist Brenda Landis is pioneering the development and publicity of makerspaces, including the Makery--a quirky synthesis of old and new. Photo by Carl Socolow '77. Between paper due dates, group project meetings, sports (varsity or club), community service, fieldwork and internships, who has time to let their minds wander—to tinker, explore or innovate? Enter Multimedia Specialist Brenda Landis, who is pioneering the development and publicity of makerspaces on campus. The idea—an outgrowth of DIY and lifehacker culture—echoes Dickinson’s interdisciplinary philosophy, which focuses on ideas and techniques overlapping among courses and departments. “It’s a blending of spaces as well as the whole liberal arts concept,” she says, “that you’re not just in one class and you learn one thing. On the Dickinson Makes website, for example, spaces include the Asbell Center for Jewish Life’s upstairs kitchen, the Goodyear sculpture studios and the Handlebar bicycle co-op. Though each space focuses on different skill sets, they all are dedicated to teaching and learning through hands-on experiences, collaboration and unstructured time. The newest addition to the makerspace roster is the Bosler Hall Makery, a room packed with what some might consider junk—fabric remnant rolls of indeterminate age, castaway toys, circuit boards and spools of yarn and wire. But there’s also a 3-D printer, a sewing machine and iMacs. Student workers in the adjacent Media Center are on hand to assist nascent makers with the more complicated tools. “The coolest thing is getting to demo virtual reality and the 3-D printer,” says Mike Abu ’16. Most important to Landis is the idea that makerspaces should be accessible. She manages the Dickinson Makes Facebook page, where she posts about maker-related campus and local events. A recent post highlights the Media Center’s time-lapse video of the Tibetan monks’ residency at Dickinson, creating a mandala in the Waidner-Spahr Library, with over three days of making condensed into a little over four minutes. And her work is getting notice off campus as well. At the annual Idea Lab poster-presentation showcase hosted by the New Media Consortium, Land’s and former multimedia specialist Andy Petrus earned the Judges’ Choice and People’s Choice awards for Dickinson Makes. Shogo Nishikawa, a visiting exchange student from Japan and teaching assistant, works with Asir Saeed ’16 on his Japanese language paper. Saeed spent his junior year in the Dickinson-in-Japan program in Nagoya. Photo by Carl Socolow '77. As you pass the glass walls into the Waidner-Spahr Library’s quiet section, it’s hard not to peek in on the lobby of the Norman M. Eberly Multilingual Writing Center. You spy a student bent over her laptop hard at work; a pair of students are caught in an animated fit of laughter. There’s another quietly perched on one of the plush green sofas, nervously clutching a hard copy of his draft paper. Elsewhere students and tutors lean over scattered papers, the center’s signature red pencils in hand. A different student sits politely next to an older gentleman dressed in a dark green camouflage uniform. Established in 1978, the center has a prominent place in Dickinson’s writing culture. Students work one-on-one with other students—sometimes their friends or roommates—to fashion an outline, produce compelling transitions or finalize a senior thesis. Tutors are fully prepared after a semester-long training course led by Noreen Lape, associate provost and director of the writing program, and they serve as a constant reminder of their peers’ agency and ability to create an effective argument and articulate it clearly. More important, though, is how these two rooms (and their multilingual counterpart downstairs) create community. Ask any tutor about the “WC Bubble,” and they’ll tell you immediately that the community of tutors is a tight-knit one, proud of its responsibility but also its quirks: During a particularly stressful week, you might see tutors, crayons in hand, working hard to fill in a cat-themed coloring book. Ranging from sophomores to seniors and majoring in everything from international studies and English to biochemistry & molecular biology, these students know that peer tutoring gives them an edge. “Tutoring is a twoway street, and my role particularly as a peer, not just a tutor, allows that conversation to happen and be more productive in the end,” says Claire Brawdy ’16, a history major and veteran tutor. With the goal of “making better writers, not better writing,” tutors are focused on connecting with each student on a personal level. While the paper in front of them is always the first priority, tutors know that establishing rapport is essential. A writer confused about his outline may be distracted by tension with his roommate; the student stressing out about her grammar may have finished the paper late last night as her homesickness kept her awake. These 45-minute appointments can be both academic and therapeutic. If nothing else, the student is able to leave the center with at least one less thing to worry about. “While there is a fine line between acting as a peer tutor and a therapist, the beauty of my position is that I can bridge that gap and use that information to help a student see the light at the end of the tunnel,” Brawdy says. The IFs are usually English language learners as well, coming to the center for assistance as they complete their studies at the USAWC’s School of Strategic Landpower. While their writing must be precise, their experience is just as important. “If they don’t get things like support in their writing, then they’ll have a really hard time and they won’t be able to experience things outside of the classroom, because all they’ll be doing is studying,” says Jeremy Beussink, IF writing instructor at the USAWC. Downstairs, the Multilingual Writing Center (MWC) reinforces that international focus, as students work on their essays for foreign-language courses. Dickinson opened the MWC in 2010, starting with seven languages and adding three more in 2011. Some peer tutors are international students studying abroad at Dickinson, and they assist students with papers in their native language. Other tutors, usually Dickinson seniors, begin tutoring once they return to campus after studying abroad. The latest community introduced into the center’s space still involves letters, but in a completely different context: Students taking introductory quantitative reasoning (QR) courses now have access to tutors specializing in mathematical and scientific tutoring. Lape recruited a committee to help design and open the QR center, in collaboration with Sarah Niebler, assistant professor of political science. With majors like economics and computer science, QR tutors help students with the basics of their QR courses, like graphing and formulas. As this issue went to press, we learned that the Small Liberal Arts Colleges Writing Program Administrators presented Lape with its inaugural Martinson Award for Writing Program Excellence. Durwin Ellerman (left), recently retired associate director of facilities management, met Ken Shultes ’89, associate vice president of sustainability and facilities planning, when Shultes was a student. The two worked together for over two decades to make Dickinson more sustainable. Photo by Carl Socolow '77. If you’ve wandered around campus, you’re probably familiar with Dickinson’s steely grasp on sustainable construction concepts and practices. For starters, we’ve got five LEED Gold buildings, and the Kline Center expansion is sure to become the sixth. Sustainability in all its facets is so ingrained at Dickinson that you might assume the college has always been this way. But that’s not the case. In fact, until about 25 years ago, very few really thought about this stuff at all. “When I was a student here, the main thing happening in operations pertaining to environmental sustainability was a student-led recycling program,” says Ken Shultes ’89, now Dickinson’s associate vice president of sustainability and facilities planning. That initiative spawned the student-faculty-administration Commission on the Environment (of which Shultes at times served as chair), which focused on reducing consumption of resources. Facilities Management soon joined the conversation, and Dickinson had just the right person to lead operational change: Durwin Ellerman, also known widely as “Whitey,” due to his snow-white hair. Ellerman began his career at Dickinson in 1975 as an HVAC mechanic and worked his way up to become head of trades and finally associate director of facilities management, before retiring in 2014. Shultes sees Ellerman—whose three children, Jaimee Reed ’99, Jessica ’03 and Durwin II ’06, all attended Dickinson—as a major agent of change for a more energy-efficient and sustainable campus. Ellerman simply saw improvements to campus operations as an extension of his lifelong ethos. Ellerman began by hooking up meters to every piece of energy equipment on campus, looking for wasted energy. And it didn’t take long for the results to come in. For example, he found a transformer in the Anita Tuvin Schlechter auditorium that was doing nothing for the building but was costing the college $17,000 per year to run. “That made me wonder, ‘What are we wasting across the whole campus?’ ” he says, going on to note that the discovery led him to rework the way the campus energy system was configured and to find other ways to stem inefficient energy use. When the price of natural gas spiked in 2005, Dickinson was socked with a $600,000 utility budget overage—basically overnight. In response, President William G. Durden ’71 asked facilities how to wrangle the budget in the face of rising energy costs. But he also understood that the gas spike was a precursor to larger sustainability challenges lurking in the future, and so he launched a new all-campus sustainability commission to identify issues and solutions. Today, the campus is a living laboratory for sustainable operations—whether it’s biogas on the College Farm or a solar-powered recharging station on Britton Plaza. Adding to the picture will be the installation of a “tri-gen” unit, which will allow Dickinson to generate its own electricity. The unit also will use the heat generated as a byproduct for heating and cooling and will reduce energy costs by more than $500,000 per year and emissions by 1,900 metric tons per year. “It’s probably the single biggest carbon-emissions-reducing project that we’ll do,” says Shultes. This project comes on the heels of a $46,900 rebate Dickinson received in July 2015 from PPL, Dickinson’s energy supplier, for energy-reduction strides made in the Rector Science Complex as part of Dickinson’s Climate Action Plan, which strives to make the campus carbonneutral by 2020. Read more from the winter 2016 issue of Dickinson Magazine.